Artist Neil Blevins, artist/writer Bill Zahn and writer Stephan Bugaj have had a successful kickstarter campaign for book their The Story of Inc Narrative Artbook now available here. 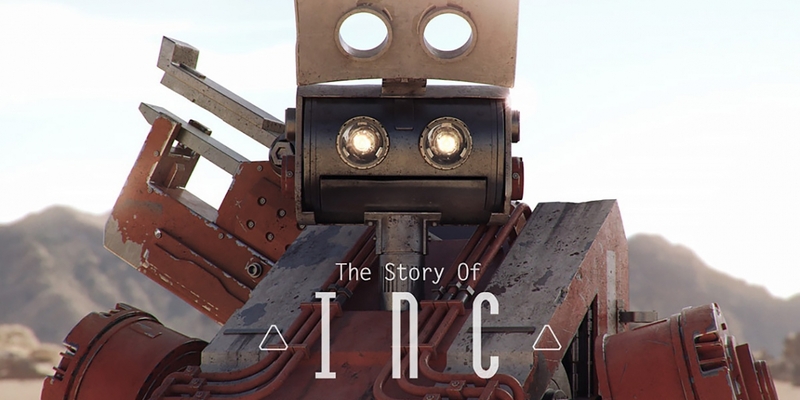 “The Story of Inc” is a scifi story that centers around a man and his robot trying to survive on an almost waterless desert planet. Their lives get turned upside down when they come across a giant alien artifact that provides plentiful water, and a society that’s built a settlement nearby who are not interested in sharing the resource. After the basics were written, a spectacular art team was assembled, veterans of the vfx, animated film and video game industry. The Inc team consists of twelve professional artists and writers, which includes current and former employees of some of the biggest names in film and video games: Blur Studio, Industrial Light & Magic, Pixar, Tippett, 343 Industries, Id Software, Blizzard, and many others. Inc features the art and writing of Neil Blevins, Bill Zahn, Stephan Bugaj, Jeremy Cook, Chris Stoski, Christina Davis, Dominic Qwek, Gio Nakpil, Jeremy Vickery, Heidi Taillefer, Nathan Fariss and Mohammad Modarres.